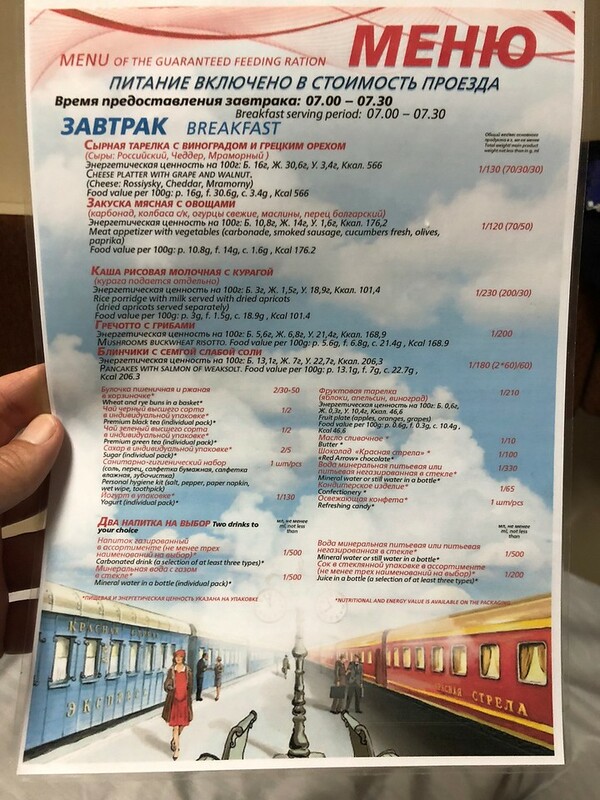 I’m not keen on flying – oh, let’s be honest, I really don’t like it, so I was rather excited to learn that we would be taking the famous Red Arrow night train from Moskovsky Station in St Petersburg to Moscow. So was Jonathan. We were even more pleased to learn; we would have a first class cabin to ourselves, well who wouldn’t. Our last experience of a night train was in Vietnam where we shared a cabin with a rather large gentleman who snored like a trooper ALL NIGHT LONG!! So after a couple of beers in Rubinstein Street, the trendy bar/ restaurant area in St Petersburg, we grabbed an Uber back to the Hotel Lotte to retrieve our bags and then another Uber to the train station. Exploring St Petersburg is ever so safe and comfortable on foot, by bus, by metro and Uber. Don’t be afraid that you don’t speak the language, smile, point to where you want to go, and the locals will help. Plus many people do speak English! 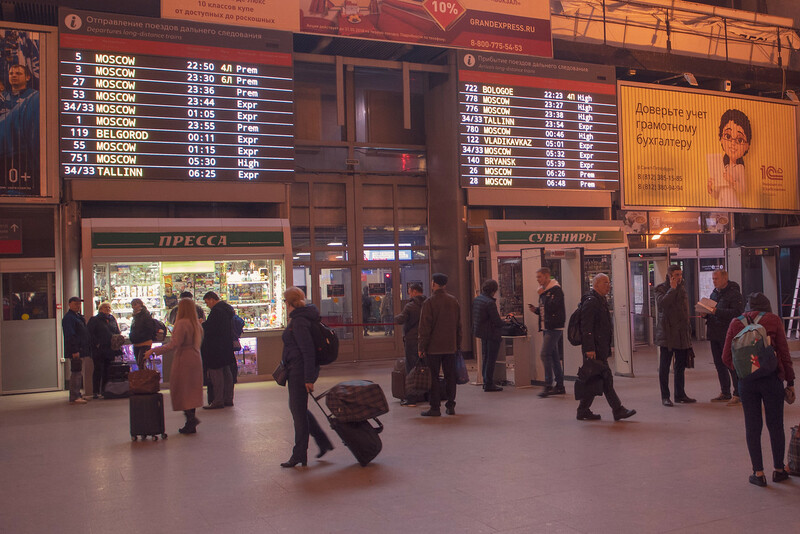 We arrived at Moskovsky Station an hour before the train was due to depart, around 11 pm. Our platform number wasn’t up on the board yet, so we found a little station cafe and relaxed for a little while. The station board showed train departures in both English and Russian and train announcements were made in English and Russian too. About 45 minutes before the train was due to leave, our platform was announced. Number 5. We headed out to the trains but couldn’t see any platform numbers. We saw a guard ‘No speak English,’ he said. I held up five fingers, he smiled and pointed to our train. We walked excitedly down the platform towards our carriage no 9. We showed our passports to our train attendant and boarded the train. Our cabin was cosy but very clean. Between the beds was a small table with fruits, rolls, water and the most delicious dark chocolate bars which I managed to convince Jonathan that he wouldn’t like. All the more for me! There was also ‘The Menu of the Guaranteed Feeding Ration.’ Not sure what that meant! On our seats were two fresh, comfy pillows, no idea where the bed sheets were. Maybe they would come later. Just before the train pulled out of the station, we heard music. The music was ‘the hymn to the Great City’ which is apparently played every time the Red Arrow Train leaves St Petersburg. At 23:55 on the dot, we were on our way. 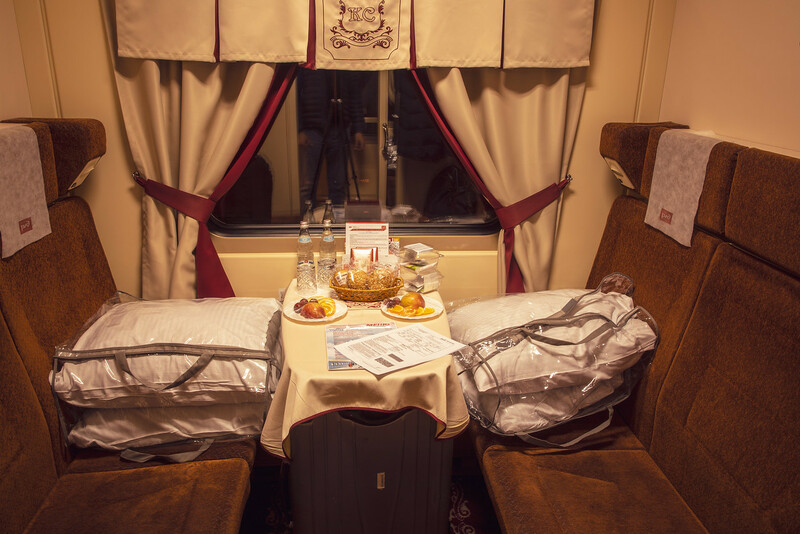 What Is It Like Riding the Red Arrow Night Train to Moscow? We began to make ourselves comfortable in our cabin. We popped to the toilet, peeking into the other cabins in our carriage along the way. Hey, how come the other cabins have sheets and we don’t! Returning to our cabin, we searched for our sheets. Under the table – no! With the pillows – No! Behind the headrests – no! We picked up the seat cushions, turned them over, yay, we found the bed and sheets. 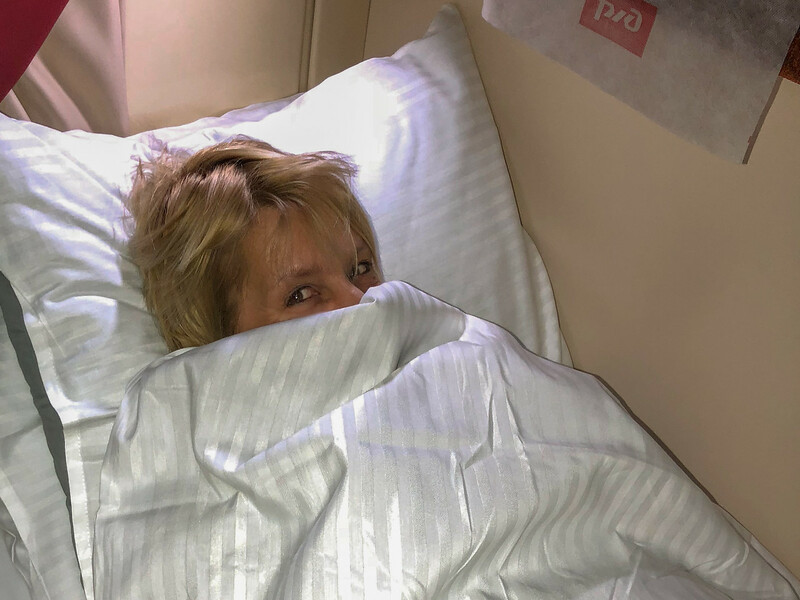 Moments later, the train attendant entered, smiled that we had worked out how to do our beds and showed us how to use the lights, adjust the temperature. ‘Breakfast, no money, no money, what you want?’ She pointed at the Menu of the Guaranteed Feeding Ration. ‘No money, no money!’ She repeated. We ordered a light breakfast and coffee and settled in for the night. The beds were surprisingly comfy, and we fell asleep to the gentle rocking of the train. At 07:55, exactly on schedule, we pulled into our arrival station. Yay, we had arrived in Moscow! Our lovely hosts Alina and Elena from Strelka Travel were waiting for us on the platform looking all clean and fresh, where we had the ‘just got out of bed on a train look’ but we were excited and couldn’t wait to get out and explore Russia’s capital city. The Red Arrow Train started the route between St Petersburg and Moscow back in 1931. The only time the train hasn’t run was during the Seige of Leningrad between 1941 and 1943. During the Soviet Times, the elite of the Communist Party used the Red Arrow to travel between the two cities. 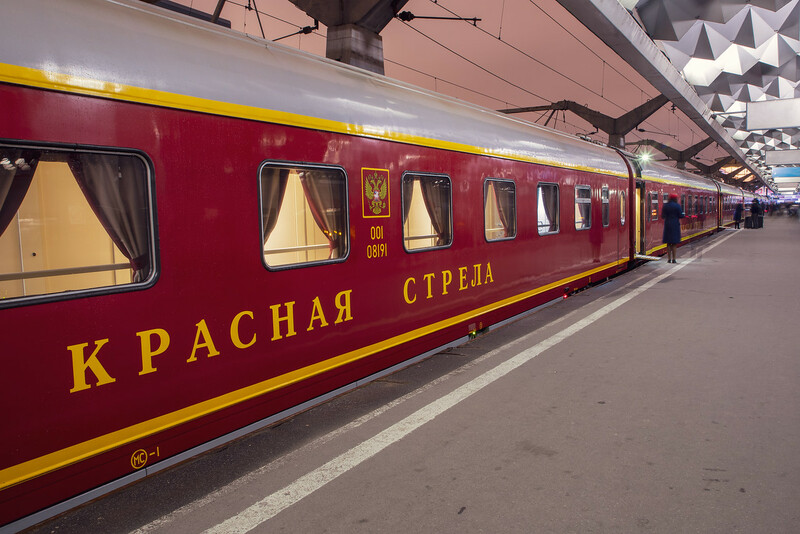 Would we recommend travelling by night train between St Petersburg and Moscow – YES, Definitely!!!!! This post is written in partnership with Strelka Travel. How cool! Trains are my favorite way to travel and this one looked comfy for an overnight ride. Yes, I prefer trains to flying. It was very comfy, a nice way to travel and saves a night’s accommodation too! wow! This is so cool. I have heard a lot about this train but I haven’t taken it yet. I am living in Moscow for almost 4 years ago. I would love to try it before I leaver Russia. Very well explained everything guys. Oh, I’m so jealous of you living in Moscow, what a beautiful city and yes you must try the train before you leave Russia. I love train travel, and would absolutely love to do this one day. I’ve not yet been to Moscow, but what a way to see the city and St Petersburg too. Beautiful photos too! Thank you, yes if I have to choose between train or flying, I prefer to take the train. If you get the chance to visit Moscow, probably best to go after the World Cup has finished, its a great city! This looks like such a fab experience. When definitely try it out when we visit Russia! We also prefer driving or taking trains over flying. The amount you get to see and experience is amazing. Ive always wanted to take a train ride. The food is certainly different from the states. I would get the pancakes and salmon for sure.